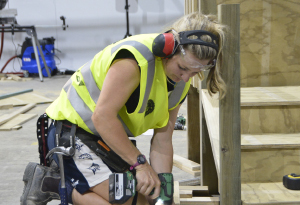 Carpentry apprentices from across New Zealand are being called to show off their skills and compete for the coveted title of Registered Master Builders CARTERS 2018 Apprentice of the Year. The competition comes at a crucial time as New Zealand’s building boom continues. With the carpentry workforce expected to grow by more than 17,000 workers by 2020 (21%), there has never been a better time to build a career in the trades. Registered Master Builders Chief Executive David Kelly says Apprentice of the Year supports the industry by showcasing the skills of its future leaders. Olivia Ward says that the tide is turning in trades - with more female builders, electricians and plumbers taking up apprenticeships. Working in construction was something Olivia Ward had never really planned for, but the young Blenheim builder is rapidly making a name for herself in the traditionally male-dominated industry. And see photos from the practical competition here. Right now there's around 11,000 apprentices in training - the majority carpenters. Carpentry apprentices are on the rise, but there's concern for a lack of work once they've completed their training. Registered Master Builder CE David Kelly hopes the NZ's Apprentice of the Year competition will encouraging more employers to take them on. A Napier carpenter has his sights set on taking home the national title at this year's Registered Master Builders Carters 2017 Apprentice of the Year. Jack Clifford will be among 10 young carpenters competing for the top award in Auckland later this week. Who will be the Registered master builders CARTERS Apprentice of the year? ...carpentry apprentice Josh Atkins (25) was last night named the Southern Registered Master Builders Carters 2017 Apprentice of the Year. Carpentry apprentice Matthew Abbott has been named the Bay of Plenty Registered Master Builders CARTERS 2017 Apprentice of the Year. The 22-year-old from Tauranga trained through the Building and Construction Industry Training Organisation (BCITO) and is employed by Calley Homes. Carpentry apprentice Logan Alderson has been named the Auckland Registered Master Builders CARTERS 2017 Apprentice of the Year. The 20-year-old from Manurewa trained through the Building and Construction Industry Training Organisation (BCITO) and is employed by CS Building. Shaun Campbell, from the Upper South Island region, has been named the country’s top carpentry apprentice, taking out the national award at the Registered Master Builders Carters 2015 Apprentice of the Year competition.